Metatarsalgia is a general term used to denote a painful foot condition in the metatarsal region of the foot, the area just before the toes, more commonly referred to as the ball of the foot. Thomas G. Morton ( I867) is credited with identifying the condition1. This is a common foot disorder that can affect the bones and joints at the ball of the foot. Metatarsalgia (ball of foot pain) is often located under the 2nd, 3rd and 4th metatarsal heads, or more isolated at the first metatarsal head (near the big toe). Differential diagnosis of Metatarsalgia is Morton’s Neuroma which exhibits localised pain than Metatarsalgia. SAVE 10% OFF ICB PRODUCTS WITH DISCOUNT CODE: 02ICB10 Offer online only! This as often it affects the sufferer’s quality of life. Metatarsalgia restricts the distances patients can walk, and causes extreme pain and discomfort. It is a simple condition to treat effectively, however left untreated, this condition can be debilitating to its sufferers. Typically the patient will present with an ‘all over burning or stone bruise feeling’, often the foot will feel swollen. There are many contributing causes for the condition, the main one being excessive pronation. 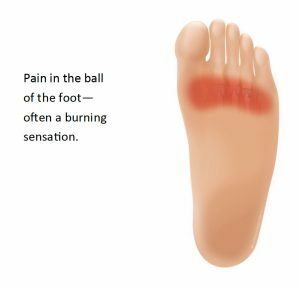 Other issues such as diabetes, Rheumatoid Arthritis, gout and excess fluid build up can all provide the environment to promote the development of increased stress on the ball of the foot resulting in Metatarsalgia. 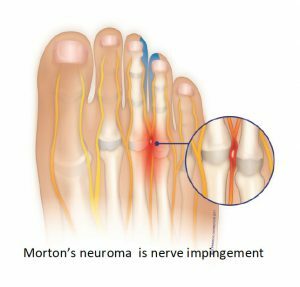 Most articles written about the condition appear to combine Metatarsalgia and Morton’s Neuroma, whereas there are two distinct conditions, one a generalised all over pain or feeling of discomfort and the other (Morton’s neuroma) a specific localised pain usually presenting between either the 2nd and 3rd or 3rd and 4th meta-tarsal joints. The more common and certainly the easier condition to address is Metatarsalgia in which excessive pronation appears as the main underlying causative factor. General podiatric opinion appears to credit the cause as ‘a forced change of the dynamics of the foot’ as outlined by ACFAOM (American college of Foot Orthopedics & Medicine). Increased obesity is often a ‘trigger’ as it places additional stress on the foot structure. Excessive pronation for any length of time can cause weakening of the soft tissue structures and as a result ligamentous laxity and muscle wastage will occur. As this occurs in the forefoot, the metatarsals plantar flex and rotation takes places resulting in the loss of the transverse arch. These shearing forces on the forefoot structures causing pressure and pain. Long term damage to the nerves may be caused and callosities will be exhibited in the patient. With this condition one or more of the metatarsal heads become painful and/or inflamed, usually due to excessive pressure over a long period of time. It is common to experience acute, recurrent, or chronic pain with Metatarsalgia. Also, as we get older, the fat pad in our foot tends to thin, making us much more susceptible to pain in the ball of the foot (Cailliet, 1983; Lorimer et al, 1997). Research has indicated that nonsurgical management is usually sufficient to achieve satisfactory results2 when dealing with Metatarsalgia. We should be encouraged to pursue conservative treatments as a first approach after establishing the underlying causative factors such as mechanics, foot anatomy, and foot and ankle deformity. 1. Identify if the feet are pronating or supinating. 2. If pronation exists then place the foot into the ideal or subtalar neutral position, and identify the amount of pronation, i.e. slight, moderate or severe. This will help you identify the appropriate ICB Orthotic type to heat mould – then mould the orthotic to the subtalar neutral joint position(STJ). It is considered that mild pronation needs less support, whilst severe pronation requires firmer orthotic support. 3. Don’t forget to consider the patient’s body weight also – light weight patients need less control than overweight patients. If the patient has been excessively pronating for a long time, not only will they have lost the longitudinal arch but they may have also lost the transverse arch. This situation will require that the practitioner heat moulds to the patient’s neutral calcaneal stance position, and will then apply a metatarsal dome to restore the transverse arch. The size of the dome will depend on the width of the foot – i.e. a narrow foot will only require a small metatarsal dome, a wide foot, a larger dome. The function of the metatarsal dome is to promote the transverse arch and separate the metatarsal heads to prevent nerve impingement and entrapment. If the foot is supinating or the patient has a high Pes Cavus foot type this allows increased pressure on the metatarsal heads and callous formation. Always check for a forefoot valgus deformity greater than 10˚. A plantarflexed 1st ray (metatarsal) can also elicit a lateral shift as compensational repositioning of the foot and may present with a forefoot valgus anomaly together with a pes cavus foot type and often clawed toes will be present. If you identify a forefoot valgus larger than 10˚, place a Forefoot Valgus addition (approximately half the size of the valgus to start with), and heat mould the ICB Orthotics with the Forefoot Valgus attached. NOTE: The Addition should be attached prior to moulding, otherwise the orthotic may become unstable in the shoe. If the patient presents with a plantarflexed 1st ray, the practitioner will need to cut a deflection around the 1st MTPJ to allow the 1st metatarsal head to drop down, and the lesser metatarsal heads will then be supported by the orthotic. For patients with both a forefoot valgus and a plantarflexed 1st ray, a metatarsal dome needs to be added to the dorsal surface of the orthotic (AFTER heat moulding), to lift and separate the metatarsal heads and reduce the clawing effect on the digits. • Sports taping to provide short term relief by mimicking the role of foot orthotics. Weight reduction can assist to reduce gravitational pressures. In more severe cases non-steroidal anti-inflammatory medications or simple painkillers. Elevate and rest after periods of standing and walking. This will take pressure off the ball of the foot, and allow it to recover. Ice pack at the site of the pain for 20 minutes on, 20 minutes off, may provide additional relief. A combination of orthotic therapy and other such treatment methods will undoubtedly be beneficial to long-term treatment success.